Children reach a deeper understanding of historical peoples by participating in the activities that shaped their lives. This hands-on series lets them discover history with projects, facts, photographs, costumes, and maps. Tested projects reinforce traditional lessons and research. A powerful, graphic style combines with informative, sensitive text. Alexandra Parsons is an author, editor, and perfectly mannered lady. Her father was a captain in the British Army and she attended Cheltenham Ladies College, one of the finest schools in the British Empire, ensuring she grew up with impeccable manners. The author is based in Richmond, London, UK. Two new entries in Thomson Learning's Make It Work! 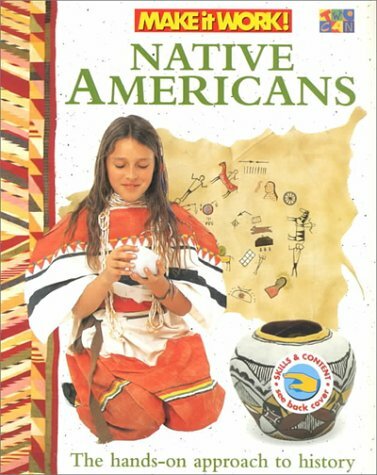 history series vivify cultures that are both anthropologically significant and perennial kid favorites: North American Indians and Ancient Egypt, both by Andrew Haslam and Alexandra Parsons. The abundantly illustrated books include not just text but games and instructions for model-making and period costuming ($18.95 each, 64p, ages 10-14 ISBN 1-56847-137-8; -140-8 Apr. ).